Got Ears? HatPhones are a very cool way to have your tunes while you keep your head warm and in style. These replacement earphones save you money if you break the phones but still have the hat. Just pop these babies in and you are back in business. 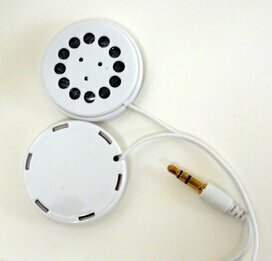 Note: We also offer an upgrade to Retractable Earphones! Retractable earphones help keep the wires out of your way. Standard cables are 48" long and available in black or white. Retractable cables are 38" fully extended and available only in black. Ear muffs and hats with earphones do double duty: They keep your ears warm and they let you use your phone or music player. We offer our brand of ear muffs called Muffones which work with all portable music players and smart phones, and we offer an extensive line of knitted hats including colors and styles to fit most tastes.